The type with the net was also placed at the end of motorway/highway offramps. 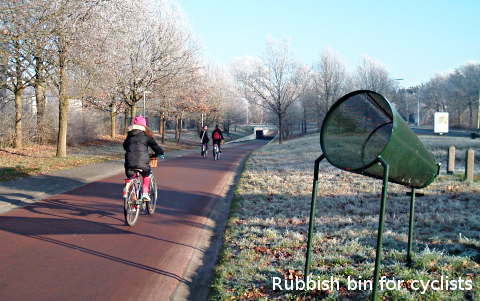 At the end of the 90's I've read (can't remember where) that after placing these bins the cost of roadside cleaning along those motorways (at least in the province Noord-Brabant) was reduced considerably. I think it's cool because it makes it into a game. Note that this was meant as fun too. Note that they are called 'blikvanger' which means eye-catcher, but litteraly also 'tin-can-catcher'. Someone thought long and hard about how to make throughing rubish in a bin more attractive to people. They can be found all over the country but nearly always near schools. Don't you have trouble with people missing? Most have a good aim, but yes, some miss. However at least then the litter is all on one place to pick up.